Guide for BU students submitting their thesis or dissertation. 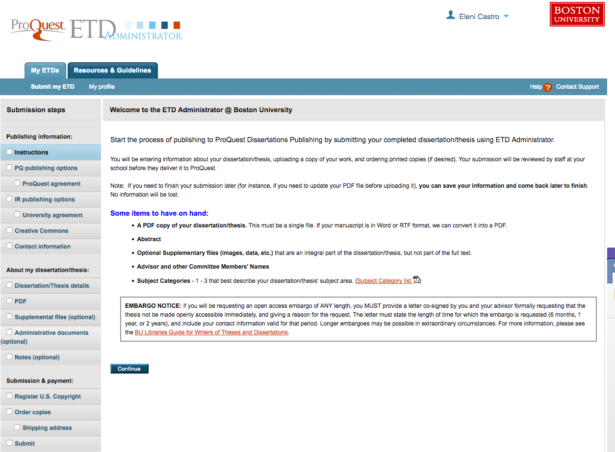 The ETD Administrator site (http://www.etdadmin.com/bu) was set up for Boston University by ProQuest, an outside company that collects theses and dissertations from all over the world and makes them available for purchase (with royalties paid to the authors once they amount to over $25.) They also collect all abstracts into a database, which they then market as a product aimed mostly at libraries. We subscribe to this database, which means that BU users can conveniently search it as part of their research. ProQuest is also recognized as an Offsite Digital Repository by the Library of Congress. 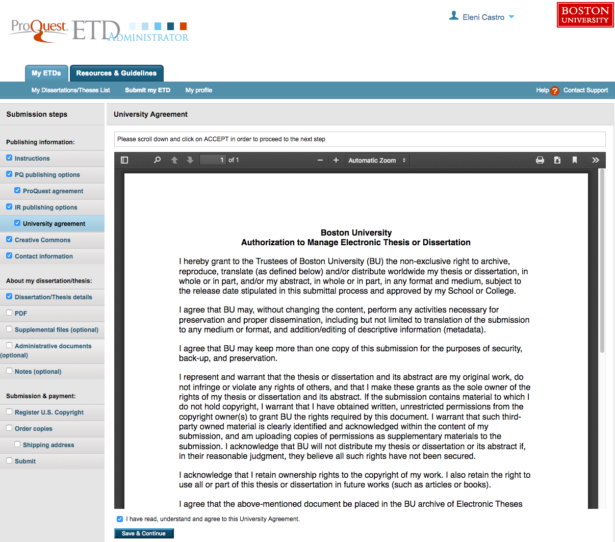 Boston University sends all its theses and dissertations to ProQuest for archival and dissemination purposes. In addition to this, BU runs OpenBU, Boston University’s institutional repository, where your thesis or dissertation will also be available—for free, to the world. Here’s a video detailing why we do this. The Guide for Writers of Theses and Dissertations explains what to do if you need an embargo. If you have any questions, please email Eleni Castro, elenic at bu edu. 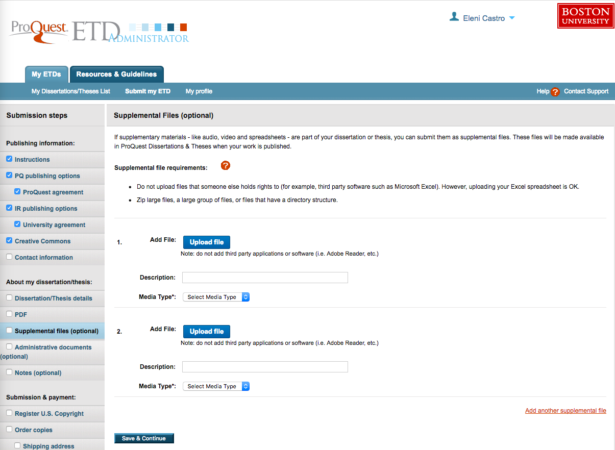 In order to submit your work, you’ll need to create an account on the ETD Administrator site. You must use your BU email address in creating this account. If you don’t, we won’t accept your submission. Your username will be your email address. Once you log in, the first thing you’ll see is this Instructions screen. Please read all of the instructions and all text of all agreements, thoroughly, and ask questions if you need to. The dissertation must be in PDF, it must be one file, and you must embed fonts and use ‘No security’ restrictions. If you’re on a Mac and using Microsoft Word 2008 or later, this happens automatically. If you’re on a PC, you may have to check a box when saving your file; please look at the ProQuest PDF FAQs linked from that first screen for more information. You may use the PDF Conversion tool that ProQuest provides off of this page, but you do not have to do this. The other thing to look at is the Subject Category list. These are very general categories, with four digit codes; you will be asked to choose between one and three of those for your dissertation. This is different from subject keywords, and we encourage you to also choose some of those: doing so will make your work more discoverable. Please note the embargo notice on this screen, read the appropriate section of the Guide for Writers of Theses and Dissertations, and follow the instructions if applicable. The next screen presents you with the publishing options. There’s only one type of publishing — “Traditional” — and the agreement text is linked from this page. You will be asked to accept it in the next step. The “Select Publishing Options” have to do with how readers will find your work. ProQuest will be selling it—but OpenBU will make it available for free, to maximize the exposure and utility of your work. The question here is: when people search for your work using web search engines, if they find the ProQuest option (for pay), it will not necessarily be obvious to them that the same work is available for free from BU. Because of this, students who prioritize exposure over royalties often choose to hide the ProQuest version from major search engines, helping to ensure that users are directed to the OpenBU version. The “Access options” allow you to choose whether or not you would like to make your work available in ProQuest as soon as it is published, or if you need to delay the release of your work in ProQuest (see Screen 4 instructions below for delaying release in OpenBU). Please note: even if you choose to delay the release in ProQuest, the citation and abstract of your work will still be available through ProQuest. 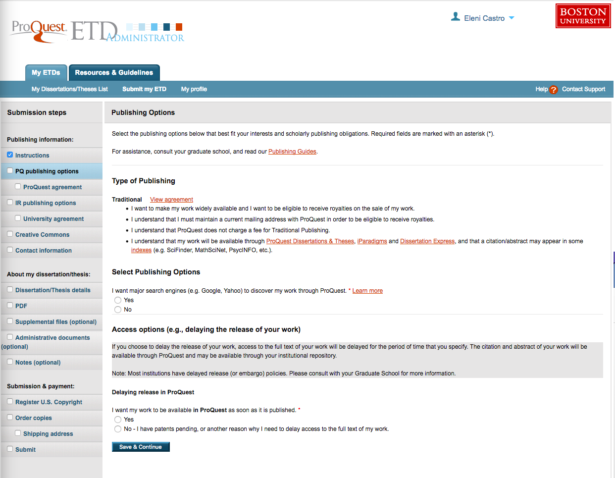 Once you make your choice on this screen, and click Continue, Screen 3 shows you the actual text of the ProQuest publishing agreement. Please read it, and refer any questions about this agreement to ProQuest themselves at disspub at proquest dot com. Most people find the ProQuest agreement uncontroversial. You must accept this agreement before proceeding. 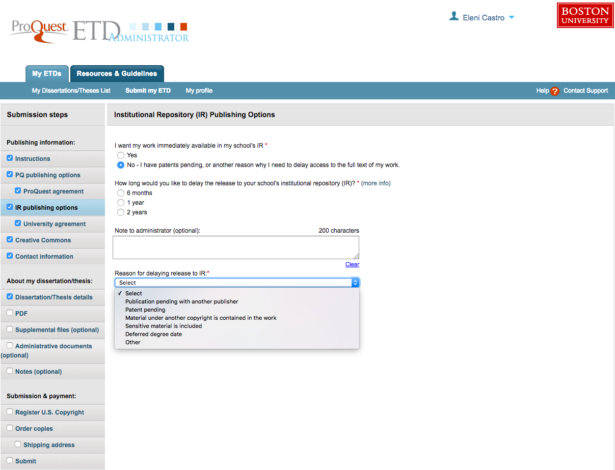 Screen 4 brings us to the Institutional Repository (in our case, OpenBU) publishing options. If you are requesting an embargo (delayed release), here is where you indicate it. Please note: if you choose any embargo, you must upload a letter signed by you and your advisor (or, if your school requires it, the dean) formally requesting the embargo and stating both the length requested and a reason for it. This is in addition to the drop-down option that you must choose in the interface if you’re requesting an embargo. You will upload the letter in the Administrative Documents step below. If you need an embargo longer than two years, please select “2 years” and write a note in the “Note to administrator” field stating how long you really need it for. Embargoes longer than two years are rarely granted, and a formal letter is still required. Embargoes are normally not granted for longer than five years at a time, though they are renewable. Read the appropriate section of the Guide for Writers of Theses and Dissertations, and follow the instructions if applicable. Please note: even if you choose to embargo your work, the citation and abstract of your work will still be available on OpenBU. Screen 5 is the second of two agreements you are asked to accept. This one is from BU. 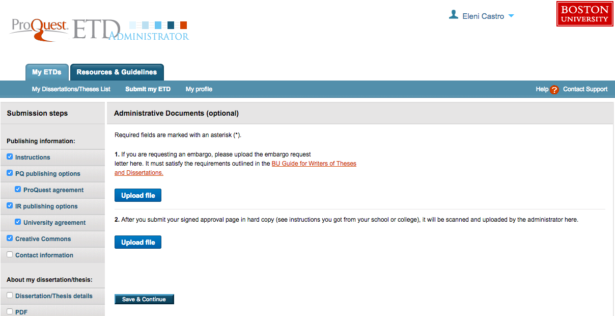 It gives BU the non-exclusive right to archive and publish your dissertation or thesis as it stands. If “publish” put you on high alert, and you haven’t seen the Open Access video linked above, we strongly encourage you to see it, and then talk to Eleni Castro (elenic at bu edu) if you still have questions. The next screen gives you the option of attaching a Creative Commons license to your work. Neither this license nor the ProQuest/BU agreements take away your copyright. That remains with you. The agreements enable ProQuest and BU to perform certain preservation and dissemination activities. 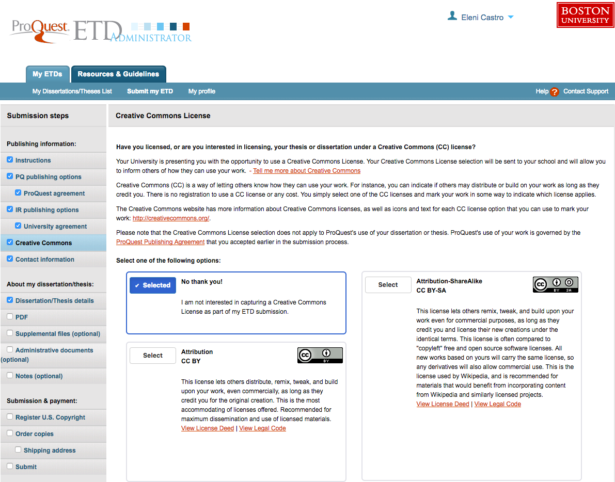 The Creative Commons license indicates to the readers of your work what they can do with it. The license is optional; you are free to select the “No thank you!” option, or any of the six CC licenses currently available. For more information, please refer to the Creative Commons website. The Contact Information (Screen 7) is where you will fill out all of your contact information. Please be sure to enter your eight-digit BUID in the Institutional Student ID field. Let us know if you have questions. Please be sure to properly capitalize the title of your work, as one would a book title. The “subject categories” will be from that long list with the four digit codes; the keywords are free-form subject keywords. Use whichever ones are appropriate and useful in your field. If your abstract uses any non-alphanumeric characters, including quotation marks etc., please take a look at the formatting hints provided by ProQuest. 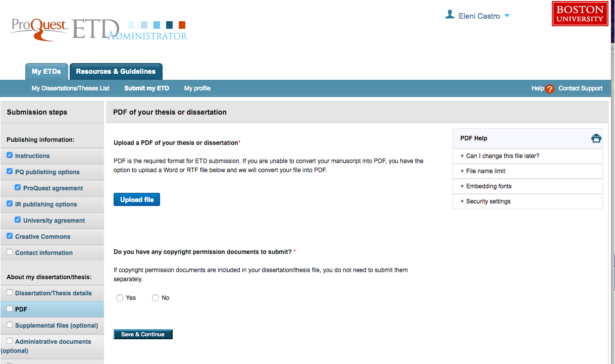 Finally, here’s where you upload the PDF (Portable Document Format) file of your thesis or dissertation. Please be sure to review your PDF file one last time before you submit it. 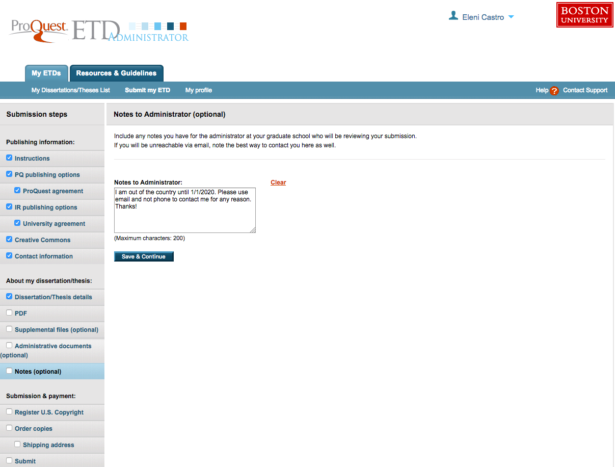 If your file doesn’t have all fonts embedded or is password-protected, ProQuest’s system will not accept it. Troubleshooting information is available on this screen under “PDF Help”. If you’ve clicked “Save and Continue” and gotten past this step without an error message, your file satisfies ProQuest’s requirements. If you are using third-party materials for which you need permission, and you have the permission documents (as you should), please answer Yes to the appropriate question on this screen and upload those documents as well. On screen 10, you have the option to upload supplemental files for your work. Most often these files contain research data, or perhaps third-party materials for which you don’t have use permissions. (If you have such materials, we can restrict access to a supplemental file while making the main file publicly available from OpenBU.) Supplemental files can be in any format. 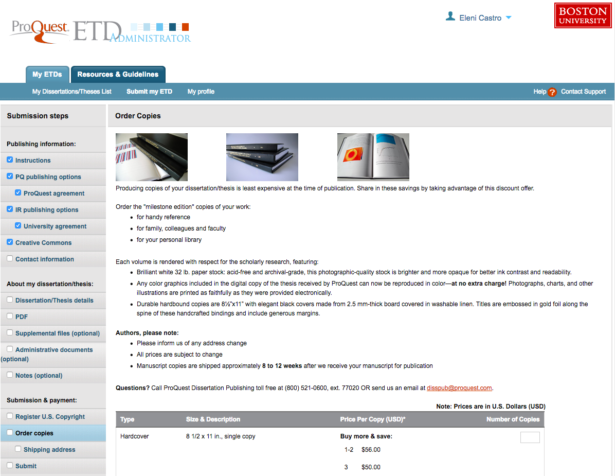 Screen 11 is for administrative documents. If you have a signed and/or approved (as necessary according to your School/College) embargo letter, please upload it here. Your signed approval page, after you submit it, will be scanned and added here for archival and adminstrative purposes. It will not be made visible to the casual user. Screen 12 is where you can send a note to the administrators from your School/College and/or BU Libraries who will be reviewing your submission. If you feel the need to clarify something, here’s where you do that. 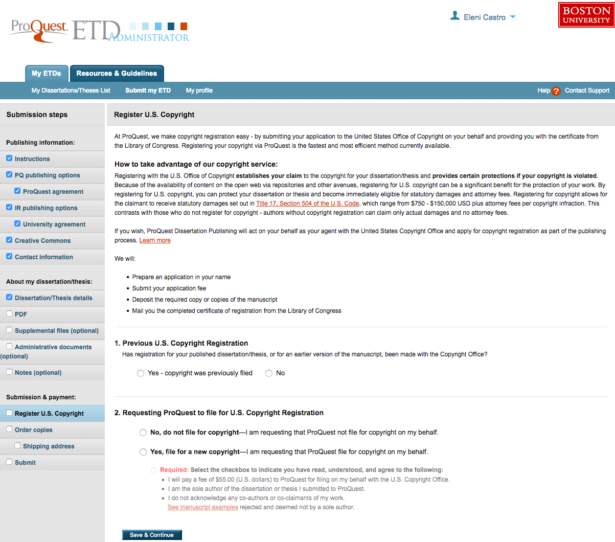 Screen 13 offers you the opportunity to have ProQuest register copyright for you. Should you or shouldn’t you register copyright? That’s entirely up to you. Here’s an important thing to understand: you already have copyright to your original work regardless of whether you register it. You are protected by applicable copyright laws without registration, in case someone sues you for infringement. However, if you need to take someone else to court for infringement, you can’t file suit unless you’ve registered copyright before the date of their offense. 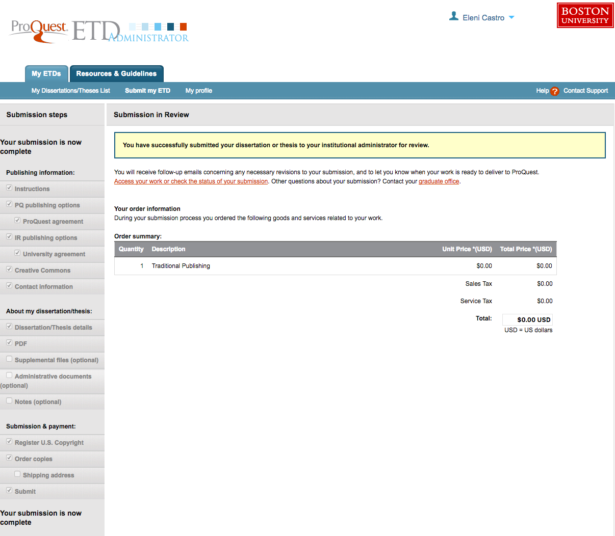 If you do decide to have ProQuest file for copyright on your behalf, that will cost you $55. This is marginally more than you would pay if you did it yourself through the US Copyright Office, but a lot less hassle. We’d say it’s worth it. Whatever you decide, the next screen allows you to order hard copies of your work. It’s optional and pretty self-explanatory. If you do decide to place the order, you will be directed to the Shipping Address screen. And finally on Screen 16 is the Submit button. After you you review your submission and correct any mistakes, if you’ve ordered any paid services (copyright registration, hard copies of your work), click “Continue with Submission”, and you’ll be directed to the payment page. Pay with a credit card as directed. Please note: you’ll be paying only the ProQuest service fees, not the BU submission fee. The BU fee, which is handled separately, can be paid with a credit card by filling out the Dissertation/Thesis Processing Fee Payment Form. 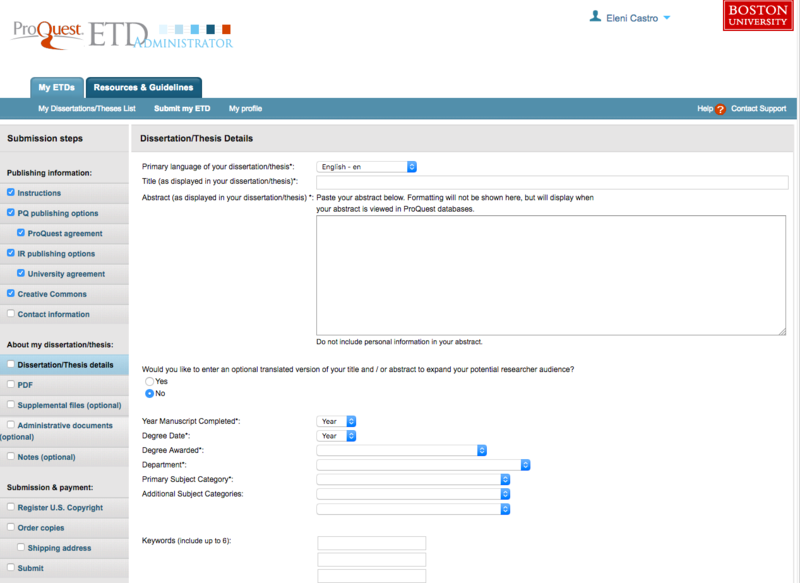 If you did not order any paid services, after you review your submission and correct any mistakes, click the “Submit Dissertation/Thesis” button. If you see something like the below, you’re done. Jessica Aither can help you with GRS-specific questions. Millie Agosto can help you with GMS-specific questions. Sean Smith can help you with STH-specific questions. 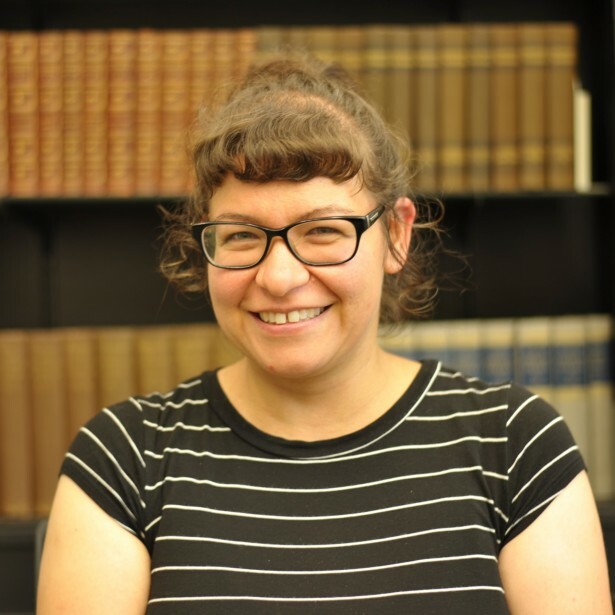 Eleni Castro is the OpenBU and Electronic Theses & Dissertations Program Librarian. She can help you with questions relating to OpenBU. Brendan McDermott is the BU Libraries Thesis/Dissertation Coordinator, and author of the Guide for Writers of Theses and Dissertations. He can help you with any other questions.